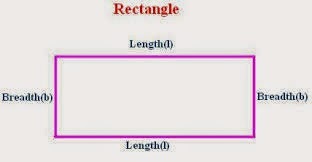 Here are important formulas and shortcuts to find out area, perimeter and circumference of different geometrical figures. Basic knowledge regarding some common geometrical figures like circle, rectangle, square and triangle etc is important for various competitive exams like IBPS, SBI Bank PO, assistant, SSC exams, Railway exam, UPSC exams. Area is amount of space inside a boundary of 2 - D object such as circle, square, triangle etc. For example if there is a rectangular sheet of 1 meter length and 1 meter breadth, than its area will be 1 meter2. If there is another sheet with length 1 meter and breadth 3 meter, so we can assume there are 3 sheets of 1 meter length and 1 meter breadth. Hence its area would be 6 meter2. 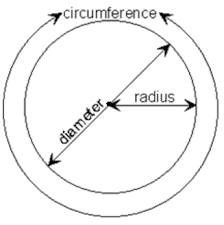 Perimeter / circumference is distance of the boundary of any 2 - D object. For example if we have a rectangular sheet of length 2 meter and breadth 1 meter, its perimeter will be total distance of the boundary of the sheet. It will be L1 + B1 + L2 + B2 = 2 + 1 + 2 + 1 = 6. Area of a trapezium = (1 / 2) x (sum of parallel sides) x distance between them. 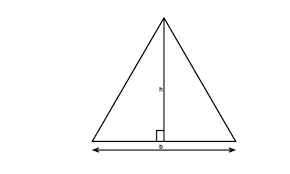 Diameter = 2 x R.
Perimeter of equilateral triangle = 3 x side. Cost of painting any surface = Area of surface x cost of panting 1 square unit. 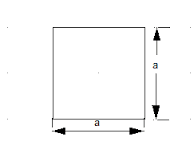 Area of 4 walls of room with height h, width w and length l is 2(l x h + w x h).